留在中國境內絲綢之路的書信 ANCIENT LETTERS, name conventionally applied to a group of Sogdian paper documents; discovered in 1907 by Sir Aurel Stein. They were found in the ruined watchtower on the Chinese frontier wall which formerly guarded the route between Tun-huang and Lou-lan. The group consists of five almost complete letters and a number of fragments of similar letters. one letter was wrapped in silk and enclosed in an envelope of coarse cloth addressed to Samarkand, 2000 miles to the west. From the letters themselves it may be deduced that at least two were written in Tun-huang and one in Kutsang. The inference that they represent the contents of a “mailbag” lost or abandoned in transit from east to west accords well with the general tenor of the letters, which seem to consist largely of reports to wealthy Sogdian merchants by their representatives abroad. The date attributed rather to the beginning of the 4th century, the letters retain their importance both as primary sources for the early history of the silk route and as the most ancient monuments of the Sogdian language. Other nationalities mentioned in the letters are the Chinese (cynt), Sogdians (swγ’ykt) and Indians (yntkwt), i.e., the Indian inhabitants of Lou-lan, who evidently had close commercial and cultural relations with the Sogdians. Most of the personal names of the merchants and their dependants are Sogdian, but the Iranian names, which include several compounded with the name of the goddess Nanai, provide information concerning the indigenous religion of Sogdiana. All the places named in the Ancient Letters (insofar as they can be certainly identified) are located along the trade route, known as the silk route, linking central China with the West . In some of these cities there were substantial colonies of Sogdian traders, as is shown by a reference to “100 freemen from Samarkand” (letter 2, lines 19-20). Since many of the letters are concerned with commercial matters, they are potentially sources of the first importance for the economic history of the silk route. Linguistic problems and the incomplete state of preservation of the letters unfortunately make it difficult to follow the details of the transactions involved. The script of the Ancient Letters is less cursive than that found in later Sogdian documents (of the 8th century onwards) and represents an intermediate stage between this and the Aramaic script from which it ultimately derives. The Sogdian commercial network grew sufficiently to ensure that in the early 3rd century, in Gansu, the representatives of Kushan and Sogdian merchants were placed on the same level and together participated in political negotiations (Sanguo zhi, chap. 4, p. 895). However, the main proof of Sogdian commercial expansion in the direction of China is provided by a set of letters, the Sogdian Ancient Letters (tr. Sims-Williams, 2001; Grenet, Sims-Williams, and de la Vaissière, 2001). Written in 313 in the Gansu corridor, these show the presence of Sogdian merchant communities in the main cities of the region, as well as in inner China. They also show that the merchants were organized within networks. The second letter, written in Gansu, is addressed to Samarkand. From the same period, in the passes of the High Indus, are found more than 600 inscriptions by Sogdian caravaneers, against only about ten Bactrian inscriptions (Sims-Williams, 1989, 1992)—a fact which gives evidence of the replacement of Bactrian merchants by Sogdians. From the 5th to the 7th century, the Sogdians were the principal long-distance caravan merchants in Central Asia. To begin with, their main destination was northern China. From the 5th century on, this area was the goal of a constant flow of Sogdian migrants who settled in the main towns, some of them managing to play a sufficiently important part to be mentioned in the sources or to leave behind epitaphs in Chinese summarizing their careers (examples in Forte, 1995, pp. 42-63; Rong, 2000; de la Vaissière and Trombert, 2004). There were at this period powerful Sogdian communities, led by “caravan chiefs” (sartapao, transcribed sabao in Chinese, Dien, 1962), whose hierarchy became part of the Chinese Mandarin system from the mid-6th century on (Suishu, chap. 27, p. 756 and chap. 28, pp. 790-791; de la Vaissière and Trombert, 2004). We do not know whether the 3rd- and 4th-century communities of inner China (as in Gansu) were continuations of the earlier ones or were newly created. The Sogdians were familiar personalities in the large Chinese cities and are represented by innumerable Tang statuettes with beards and prominent eyes and noses. Tombs of Sogdian merchants have been found, featuring sumptuously decorated funerary beds in stone. Until the mid-8th century, the Sogdian trade network was the main continental medium for export and import of luxury products in China and so controlled the principal transasiatic trade route. In Alexandria in 550, the Nestorian Cosmas Indicopleustes pointed out that it was by caravan routes, rather than by sea, that Persia received most of its silk (Cosmas Indicopleustes, II, pp. 45-46). The conquest of Central Asia by Chinese armies no doubt changed the economic conditions within which the Sogdian merchants operated. From 640 to 755, importations of western luxury products increased even more (Schafer, 1963); but with a view mainly to finance their expansion and pay their troops, the Tang empire sent more than 10 percent of its fiscal receipts to the West, for the most part in the form of silk and hemp rolls (Trombert, 2000, pp. 108-9)—a manna from which the Sogdians benefited as the main intermediaries of this great trade. The other great zone of expansion of Sogdian trade was the steppes. We have no sources directly dealing with trade in the steppes during the early Middle Ages, but the Chinese and the nomadic powers often used Sogdian merchants as gobetweens, and this provides us with some information about their activities. From their bases in Gansu and Turfan, the Sogdians set off as small peddlers traveling among the tribes from the 5th century on and perhaps even much earlier (Wei shu, chap. 103, p. 2310; de la Vaissière, 2002, pp. 202-4). The Sogdian language loaned to Turkic certain significant words (Old Turkic borč “debt,” Sogd. pwrc; or Uighur styr “coin,” Sogd. styr). The birth of the Turkish empire and its extension throughout the entire steppes greatly contributed to the economic power of the Sogdian merchants. They provided the Turks with their first chancellery language and administrative infrastructure. The first known Turkic inscription, at Bugut in Mongolia, is in Sogdian (Klyaštornyj and Livšic, 1972 **), and the first historical text to mention the Turks from the standpoint of the Chinese connects them with the Sogdians (Zhou shu, chap. 50, p. 908). Menander Protector’s history does likewise on the Byzantine side; in particular, it reports an actual case, within the period 568-75, of how the Sogdians used their diplomatic influence with the Turks to open up new markets. After failing with the Sasanians, the Sogdian merchants persuaded the ḵāqān to get in touch with Byzantium in order to export the thousands of silk rolls which China paid as tribute to the Turks (Menander, tr. Blockley, pp. 111-15). Under Turkish protection, and later under that of the succeeding states, the Sogdians established themselves within the trade of the western steppe. In the 7th century, when a trading entrepôt under Khazar protection was founded in the Crimea, it bore the name Sogdaia. During this period almost half of the Sasanian and Central Asian silver dishes found near the Urals had gone through Sogdian or Khwarezmian hands, and in the 8th century, three-quarters had done so (de la Vaissière, 2000, pp. 368-69). Sogdiana was the center where some of the luxury fabrics imported by Byzantium and the West were traded at that time (Shepherd and Henning, 1959). Fragment of one of the 4th century letters written by an abandoned Sogdian wife. Miwnay with her children dutifully followed her husband Nanaidhat, a merchant trading along the Silk Road, to the city of Dunhuang. Both were Sogdians, a group who emerged as a power at the center of the trade routes at the end of the second century CE. 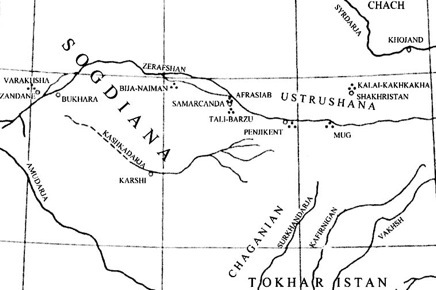 Sogdiana lay between the Amu Darya (Oxus River) and the Pamir Mountains in what today is Uzbekistan. The Sogdians ability to reap profits from trade along the Silk Roads lead them to established communities in regions as far east as Chang’an, (today’s Xi’an) and far west as Constantinople. Unfortunately, after the collapse of the Chinese central government, wars and famine reached Dunhuang. Nanaidhat left the area, traveling off with his caravan, and somehow never retunred, leaving Miwnay for three years. Left destitute, well-to -do Miwnay was forced to become a servant of the Chinese while her daughter Shayn ended up guarding their flocks of domestic animals. With no one in the Sogdian community willing to help them, Miwnay wrote letters to her husband and mother, who apparently never answered nor sent money. Letter to Nanaidhat: "I obeyed your command and came to Dunhuang and did not observe my mother's bidding nor that of my brothers. Surely the gods were angry with me on the day when I did your bidding! I would rather be a dog's or a pig's wife than yours!"